I have a new piece on Forbes that I loved researching. An exciting renovation includes tales of forgotten wine, Thomas Jefferson visits and sheep in the vineyards. Read it all here. The Cadillac Côtes de Bordeaux St. Germande Graves 2012 was was a red wine that retails for 9 euros. The wine was a light opaque red/purple color. The wine was light bodied with bold tannins. This dry wine offered dark fruit notes. The AOC Cadillac Cotes de Bordeaux Mozart 2012 was a translucent dark purple with red color. This wine was full bodied with dark red fruit notes that reminded one of black cherries and blackberries. The aftertaste was long and tannins were on the finish. Very excited to hear I am a finalist in the 2019 Millesima Blog Awards for Wine Travel. The wine story is called The Roussillon of Southern France: Fortified and Sweet in More Ways than One. The story is very special for me because visiting this wild, untamed region had always been a fantasy. And of course, during my long years studying for the Wine and Spirits Educational Trust (WSET) we HAD to know all about Banyuls Grand Cru. Raise your hand if like me, you thought Sweet Bordeaux would refer to just the wonderful wines of Sauternes? I learned preparing for the Snooth facilitated #GoGoldenBordeaux tasting that Sauternes is one of ten appellations producing these dessert wines. Bordeaux is the only French region which allows for the development of Botrytis Cinerea – aka noble rot. And this derives from the region’s oceanic climate which alternates between humidity and heat. When the Sémillon, Sauvignon Blanc, or Muscadelle grapes hang on the vine a little past their harvest peak then noble rot ensues. This grape concentration produces a golden colored wine with intense aromas and flavors. Very exciting to see old friends from Bordeaux come to New York this week for a tasting of excellent wine from the various appellations. Nicholas Glumineau was on hand to present several vintages of Chateau de Pez in Saint-Estephe, Chateau Haut-Beausejour, and Chateau Pichon Longueville Comtesse de Lalande. Herve Gouin was on hand to present Chateau Mouton Rothschild from Paulliac as well as Chateau D’Armailhac, and Chateau Clerc Milon. Cathleen Burke Visscher presented Chateau Ducru-Beaucaillou, and Chateau Lalande-Borie. Veronique Sanders was also presenting Chateau Haut-Bailly. Jean-Philippe Lemoine presented Chateau d’Yquem, the dry wine as well as two vintages of the sweet wine. Christian Moueix and Kassidy Harris presented an assortment of wines from the many estates including Chateau Hosanna, Chateau Certan de May, Chateau Bourgneuf, Chateau Lafleur-Gazin, Chateau Magdelaine, Chateau Puy Blanquet, and Chateau de Sales. 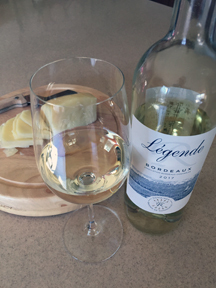 The post Chateau Angelus and Organic Viticulture in Bordeaux appeared first on The Wine Sleuth. Weekend Wine Notes: Allons, enfants de la patrie! The French governing body overseeing wine appellation regulations, the National Institute of Origin and Quality (INAO), announced this month that wine producers are now allowed to hold back more stock, following recent losses caused by extreme weather conditions. The action enables winemakers to set aside a portion of any vintage in order to maintain a supply for future use. The INAO compared the action to “crop insurance” as a measure of adaptability. The current stock storage rules date back to 2013, put in place in order to maintain a reasonable reserve in the case of adverse conditions resulting in reduced quantity. Prior to the June 2018 announcement by the INAO, wineries were allowed to hold back an amount equal to 10% of their stock. To read the full story, please visit my Forbes contributor page here. I’m fascinated by Côtes de Bordeaux which is comprised of Blaye, Cadillac, Castillon, Francs and Sainte-Foy appellations. Look at these growing regions as a sorority of sorts — unique individuals grouped together with a common purpose. In each category and for each zone, the article that gathers the most votes will win the grand prize, meaning an all-expenses-paid trip to Bordeaux in April 2018 during the famous “en primeur” week.